I volunteered at the downtown Memphis Farmer's Market this past Saturday morning. Not only did I get to meet several local farmers/vendors (and a free t-shirt! 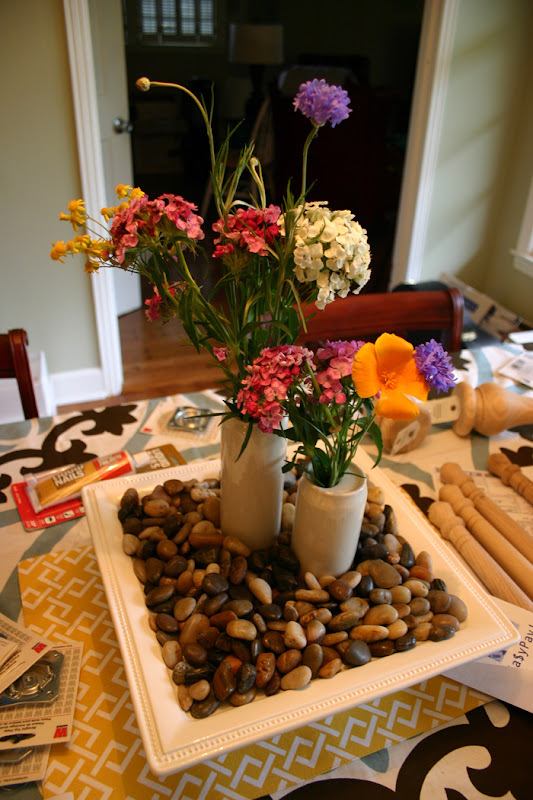 ), but I also walked away with a $5 wildflower bouquet we've been enjoying all week. Volunteering or shopping, it's a truly WONDERFUL way to spend your Saturday morning if you are so inclined. You can sign up to get on their volunteer list through the website. 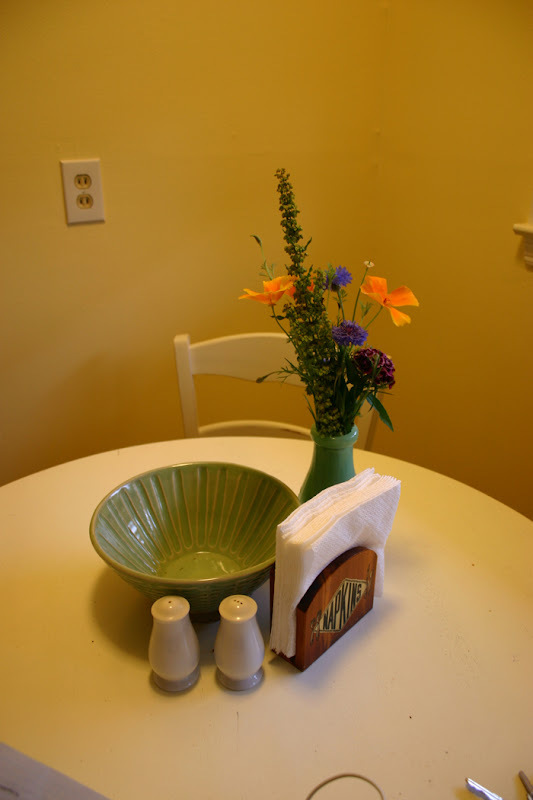 Not one to leave you hanging [if you're still reading]... here's a little before-and-after action of the ole dining room. Remember the is-it-plum-is-it-grey-is-it-brown colored dining room? I DO. Well, this room was the very first thing we painted in this house [with much-appreciated help!]. I could not WAIT to affect some change in this room. And here we go. Disclaimer: By no means do I consider this room "finished"--nothing is hung on the walls, there are still boxes everywhere, no window treatments, light fixture not exactly right, blah blah blah. But still. Progress? Whew! So much lighter and open-feeling, right? Acceptable start? Still haven't unpacked my suitcases. Ha. where were you volunteering? pete and gibson and i were up there! i came thisclose to adopting one of those golden lab/golden retriever blend puppies. so cute! the house is looking great, keep it up!! 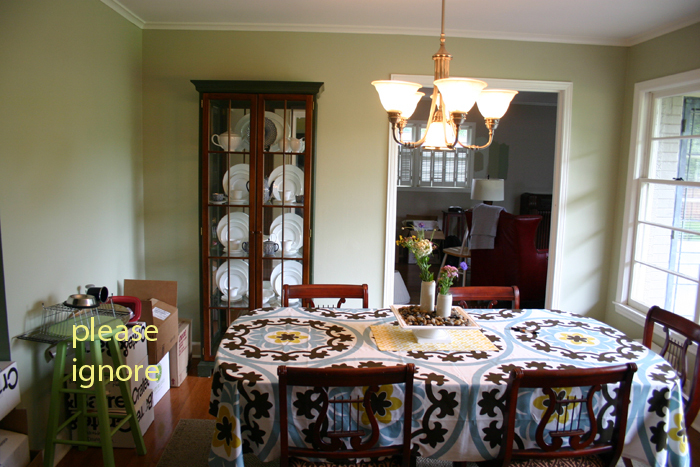 love the new dining room color! and i'm dying over your great windows. dying. Cute!!! You are such a good decorator. I LOVE the green color in the room over from the (old) plum room. Are you keeping that? I'd love to know what color it is. It is looking good! Love the Target table cloth. Can't wait to come by and see the finished product.